Time. I really want to insert my favorite Dr Who quotes here but I won’t. Teaching kids the idea of chronology and time is tough. For a chunk of my education career I worked in a nineteenth century living history museum. Teachers would book our field trips to cover content such as Native American studies, Westward Encroachment, colonial period, or just because they wanted to show kids old timey things. Old Timey: it’s a real thing. Teachers and students have said it aloud a million times. It becomes default as teachers look into the eyes of students who may not be as old as the car they are driving ( and let’s face it we’re teachers, so Dodge Dart drivers REPRESENT!) and realize that their kids have no concept of time. This is especially difficult because every state has some kind of standards dealing with time. K.6 Students understand that history relates to events, people, and places of other times. Identify the purposes of, and the people and events honored in, commemorative holidays, including the human struggles that were the basis for the events (e.g., Thanksgiving, Independence Day, Washington’s and Lincoln’s Birthdays, Martin Luther King Jr. Day, Memorial Day, Labor Day, Columbus Day, Veterans Day). Know the triumphs in American legends and historical accounts through the stories of such people as Pocahontas, George Washington, Booker T. Washington, Daniel Boone, and Benjamin Franklin. Understand how people lived in earlier times and how their lives would be different today (e.g., getting water from a well, growing food, making clothing, having fun, forming organizations, living by rules and laws). 4.4 Students explain how California became an agricultural and industrial power by tracing the transformation of the California economy and its political and cultural development since the 1850’s…. “Time Scripts” are basically about putting things together in a temporal way that are related in cause and effect. It is related when there are significant changes that then lead to events or other changes in time. In the end, it may not put squarely in your students psyche when the Homestead Act occurred in relation to their birthday, or the time Tommy Handsworth swallowed three earthworms on a dare, but they might be able to anchor it in their thinking in relationship to why where they live was able to become a state. And learning that one thing affects another thing, that affects a bunch of others and leads to them have their seventh birthday party in the state of Washington. So how do I teach it? Join us next time to find out! Teaching social justice, civil rights, and history is the best part of my job. I also love primary sources, thick high level texts, and I LOVE LOVE LOVE the sound of my own voice droning on and on about these topics. Surprise: my students DO NOT love it! So I look for books that can keep me from boring people to death. Recently we were looking at issues of school segregation. For years I have had kids analyze the painting The Problem we all Live With as a jumping off point. There is great supporting material, but it tended to be me doing too much pontificating so I wanted to put the learning in the kids hands. I needed something super accessible and redaily availible to achiebe this goal. Using picture or non-fiction story books to teach is as old as the genre itself. I have a math curriculum that invokes it to teach a number of math concepts. One of my favorites is A Remainder of One. Kids get a graphic representation of the concepts and even the steps involved in a relatively complex structure. But ,when dealing with hard historic, and social topics, it can be difficult to find texts that accomplish similar instructional goals. 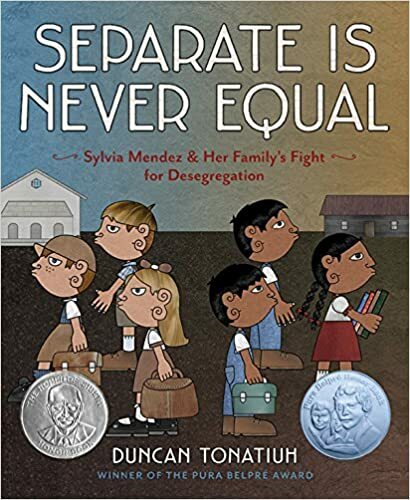 Seperate is Never Equal by Duncan Tonatiuh may be one of my favorite all time civil rights picture books. Its a bit long for a read a loud, but I have seldom seen the issues of race, segregation, and the democratic process spelled out better for learners. It met all of my criteria for a useful teaching tool! If they do, then I know I have a pretty good teaching tool. I would draw on prior knowledge regarding the Civil Rights movement. Kids could do a turn and talk, then put what they know on post its. I would have them put them up where we could all see it. I’d commend them on their knowledge and tell them that they are going to help decide if the books we have in class will be effective to learn about this very big topic. Now it is time for a vocabulary sort . Use this link to find the document. A vocabulary or content sort can be sorting words into groups, but you can also match definitions or concepts with words or phrases. I keep everything in ziplock baggies, pass them out to small groups, and give them five minutes for the matching. Today I want you to look through the baggies and match words or phrases with definitions. When the groups are done I just call on kids and see if we have the ideas matched with the correct terms. In pairs, students will select books and use sticky notes to indicate where they find evidene from the vocab sort done earlier. This takes a while. Kids have to read the books, look for evidence of the criteria and mark them with stickies. It can also be done with a worksheet, but I haven’t developed one for this activity yet. To wrap up, I do a simple share of what they found and I ask them why they think having these criteria help indicate if the story is worthwhile or not. Today we looked at some pretty big ideas like Oprresion and images of difference. We found out that effective stories about strugglles for civil rights include realistic images, language and ideas. We will use these criteria in creating projects in coming days. The time was early 2000. Blogs,Teacher Pay Teachers, Pinterest and all those goodies were yet to emerge, so often I was looking in actual books, or sifting through what was available online for the perfect way to share content, engage kids, and meet standards. I still look on the interwebs for good ideas, but often they are monetized and are usually teasers. How many times have you signed up for something to get the free trial, only to forget you did, and now you are stuck with a monthly bill to Teacher Spot or Lesson Hole, and in the end whatever you pulled down tanked with your students anyway? So I am going to try and write a blog. I will do my best to share links and content that are free, or when you do have to pay, at least tell you a bit about what you are getting into before you do it. Warning: I teach upper elementary through middle. I focus on language arts and social studies, BUT I also dabble in math and science. It would be great when I am 40 posts in to have guests in other areas contribute, but I just want to be clear that you will get a lot of teaching history, and language but in the end let’s hope formats can cross subject lines. 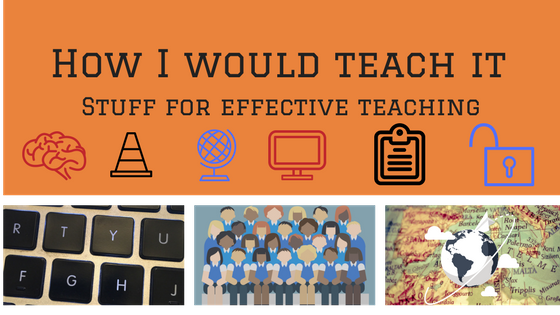 So I will write posts about (insert topic,standard, content piece) and then tell you how I would teach it. I won’t list standards or connect 21st century butter churning benchmarks, or write objectives, or essential questions or DBQs. At least not on purpose. I don’t want to teach you how to please whatever boss, government, or grade level you are in. I just want to show you what I think is authentic, helps kids learn to think, and share stuff that makes our world a better place. So if you read any of this and like it. If you want to share some of your knowledge, resources, or want a 5 x 7 glossy of me that I use for local theater productions, just drop me a line.